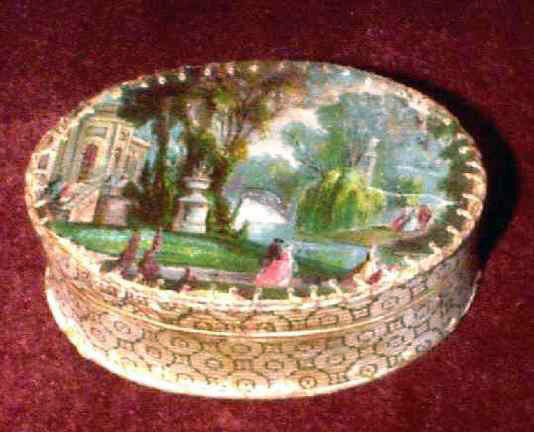 Presented here, a very fine little Wallpaper Covered Box dating from the first half of the 19th Century. It is a mere 3 1/4"long and 2 1/8" wide with stitched construction on both the lid and the bottom. This box was most likely made to hold trinkets as it is a miniature counterpart of the bandboxes that were so popular in those days. Needless to say, these little treasures are not as plentiful as the larger ones and their sheer size makes them rare. The colors are vibrant and the overall condition is excellent.